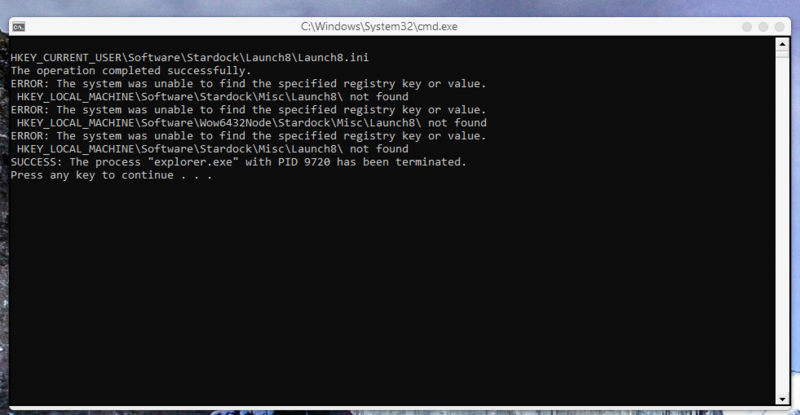 I'm getting the error "invalid uninstall control file" (see screenshot) and can't install ANY of my Stardock programs. On the forum, I've found "purge" .bat files for some of the other programs I want to uninstall but I can't find one for "Launch". Please provide me with a way of uninstalling this program. It would also be helpful if you provided us with a way to purge ALL of our downloaded programs since I don't want this issue with other uninstalls. I tried that, and it uninstalled Launch (ie. it no longer shows as installed in the Object Desktop Manager). But the Launch pad is STILL there when I click on my start menu. Start is supposed to be uninstalled too. Yes, I restarted my computer. Yes, I made sure that "silently install updates" is disabled. Sending back to support for more help. Not sure, what you mean by that bold part. Do you intend to uninstall Start8/Start10 too? At this point, the problem seems to be "Launch" only (it still shows up) when I open my regular Windows Start. Please post a screen capture of the Launch appeared even after you have purge it. Screenshot #1- after running .bat file. Screenshot #2- after restart, Launch comes back! When you go to Add / Remove programs, and try from there, what happens? If it still fails, actually reinstall Launch, reboot, and try Add / Remove again. Thanks- I tried and it seems to have worked.